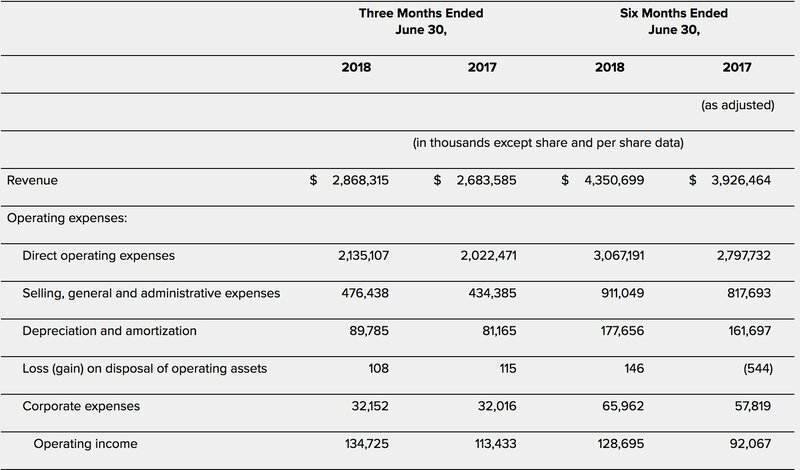 Live Nation’s half-year financial results for 2018 are in – and they’re massive. The company yesterday (July 26) posted a sales figure of $4.351bn for the first six months of 2018, up 11% year-on-year and 9% on a constant currency basis. That number becomes even more remarkable when you look back through recent history. It’s not only over 50% up on LN’s mid-year sales in 2015 ($2.886bn), it’s actually more than double (+118.6%) the firm’s H1 tally in a year as recent as 2010 ($1.99bn). CEO Michael Rapino (pictured) must be standing particularly tall today: when he took over at Live Nation in 2005, the company’s mid-year revenues stood at $1.186bn – over $3bn smaller than its H1 2018 tally. 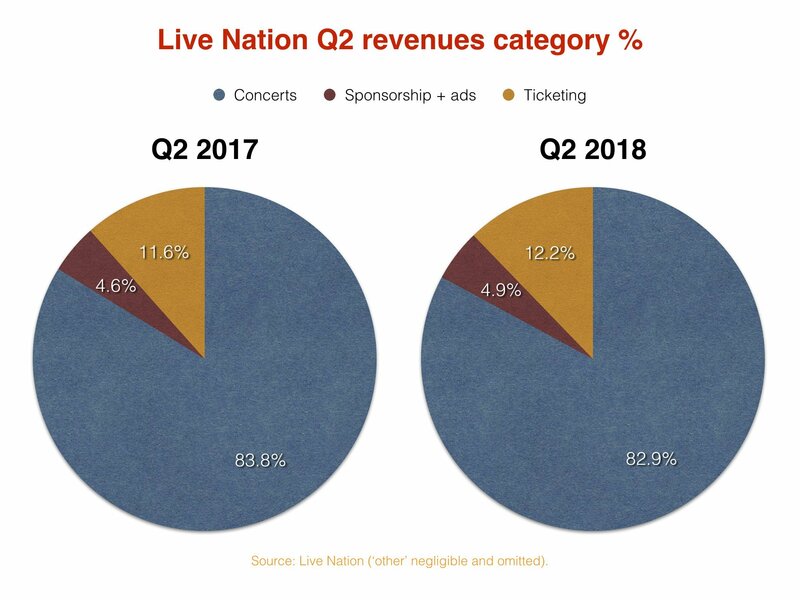 The second half of the calendar year is likely to be even stronger for Live Nation: in 2017, the firm saw annual revenues top $10bn for the first time at $10.337bn, up 23% YoY at constant currency. 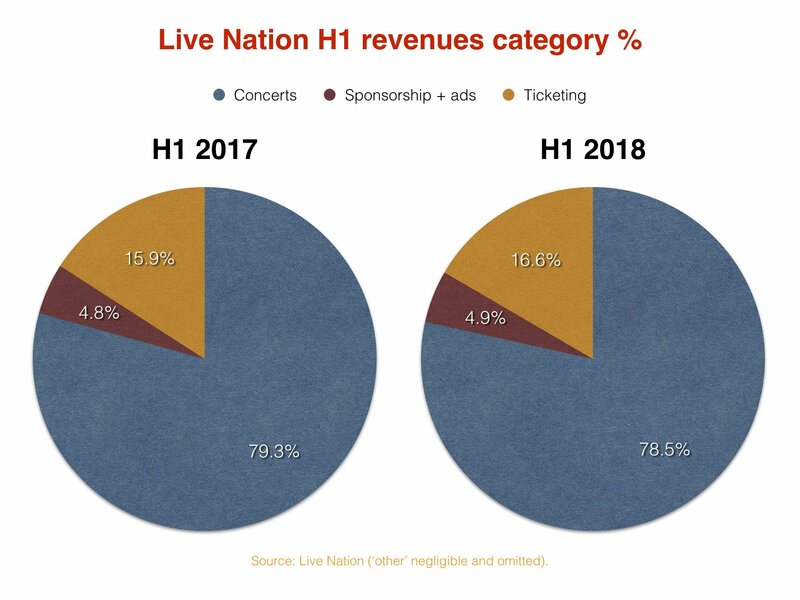 Some $3.42bn of Live Nation’s H1 2018 revenues came from its concerts division, which includes its live promotions division and (these days) also any commission it receives from its worldwide network of artist management companies. That figure was up 10% year-on-year, or 7% at constant currency, and contributed 78.5% of Live Nation’s overall midyear sales. The firm’s sponsorship and advertising division turned over $214.5m, up 14% year-on-year or 11% at constant currency. 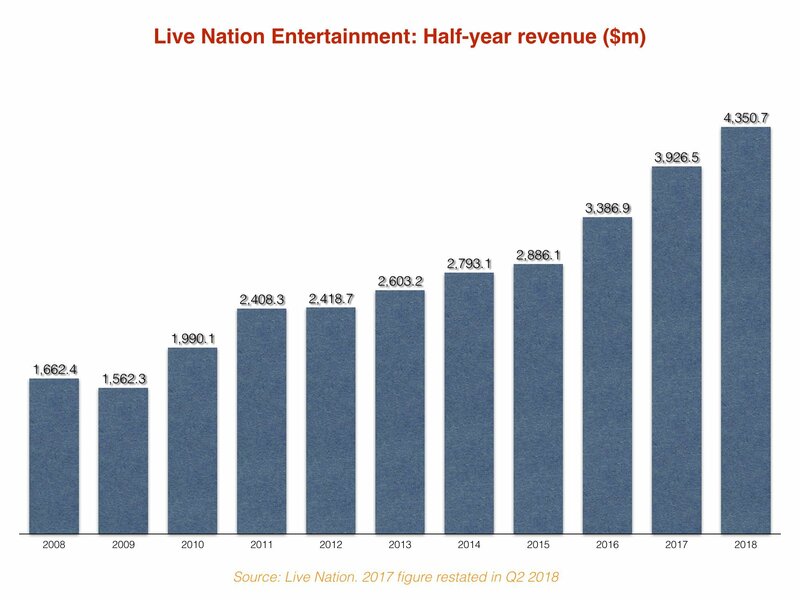 And its ticketing division, including the operation of subsidiary Ticketmaster, saw revenues grow 16% in H1 2018 (or 14% at constant currency) to $723.6m. Half-year operating income grew 40% (39% at constant currency) to $128.7m, while adjusted operating income for H1 hit $374.1m – up 19% or 17% at constant currency. Net income reached $42.3m in H1 2018. On an earnings call with investors yesterday (July 26), Michael Rapino revealed that, including July, LN has sold 70m tickets to shows this year to date – almost 3m up on the same point of 2017. He also directly addressed the secondary ticketing market, commenting that trade approximations suggest ticket resale is still an $8bn industry each year – something he sees as a major opportunity for the primary ticketing marketplace. “There is a huge secondary business that still exists, which still means that pricing inefficiency is alive and well for both sports teams and great artists, where the primary [sale] price is leaving a lot of money on the table,” said Rapino. 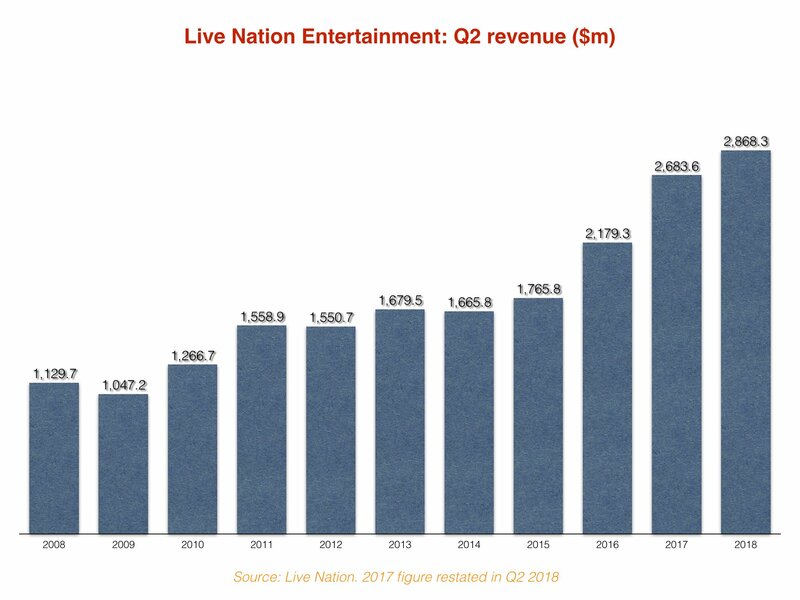 In terms of Live Nation’s Q2 results, the company posted $2.868bn for the three months ending June 2018, up 7% YoY (or 5% at constant currency). Concerts revenue hit $2.38bn in the quarter, up 6% YoY (or 4% at constant currency). Sponsorship and advertising turned over $139.9m in Q2, up 12% year-on-year or 11% at constant currency. Ticketing saw quarterly revenues grow 13% in H1 2018 (or 12% at constant currency) to $351.2m. Q2 operating income grew 19% (18% at constant currency) to $134.7m, while quarterly adjusted operating income hit $260.3m – up 18%, or 16% at constant currency. Quarterly net income reached $83.4m.